At times, what makes something fresh and different may only be a simple setting change. While rightly considered a high school drama, Hanasaku Iroha places particular emphasis on life subjects not usually touched upon in high school dramas; subjects beyond just love octagons. The series takes a hands-on approach in exploring the very human lives of the characters who work at Kissuiso Inn, utilising their various character developments and plots to present the audience a collection of life lessons that ranges from parenthood to a simple lesson of teamwork. The always dynamic atmosphere of Kissuiso makes the setting feel like a real place and the characters feel like real, breathing human beings; a big credit is due to the concept artists as well, which I will go into later. Like most Slice of Life genre contenders, the characters make the entire show. Whilst Hanasaku Iroha does offer a solid series of story plots, the colourful cast of characters are what makes this show engaging from start to finish. The top of the ladder presents an already unconventional character dynamic of three family generations: starting from Sui, the 70 year old owner of Kissuiso, her daughter, 38 year old journalist Satsuki, who’s also the mother of 16 year old Ohana, our main lead character. There exists a particular flavour of familiarity that these three family members share in terms of life experiences, which makes it all the more interesting to watch how the ‘like mother, like daughter’ characteristics materialise through different lives and time periods. Of course, there’s also Satsuki’s younger brother (Ohana’s uncle), but his role in this family dynamic only plays a big role towards the end of the show. Subjects beyond just love octagons. ‘Festing it up’; a saying that sprouted from Ohana’s abnormally powerful vocal chords during a time of desperation, essentially forms the basis of these three characters’ stories within the series and the overall theme that Hanasaku Iroha offers. What makes this saying frustrating, is the general lack of definition: it is a seemingly empty saying with no literal meaning behind it. However, as a catalyst for further analysis, Ohana’s family members (including herself) all share a tiger’s determination to succeed in their lives and to achieve their own goals ruthlessly. This common personality of their respective characters each meant resulting consequences in the form of a dysfunctional family, where the parents ignored the needs of their children for the pursuit of their own dreams, which of course acts as the overarching story of the show. So essentially, As a defence mechanism, after being raised in an environment where no one could be trusted other than herself, Ohana’s independent and fiery nature is put to the test as she started working at her grandmother’s inn. Ohana’s character is one of mean-spirited determination, one that can be both considered as admirable and at times self-harming. As a teenage girl, Ohana was forced to grow up earlier than she was meant to and had no father to speak of and a mother that is irresponsible at best, downright obnoxious and selfish at worst. It is thus rather interesting, to find Ohana a person who is direct in her confrontations, physical and practical in her intentions and is overall a very pleasant and strong character in her own right: what she learns in this series is a sore need of friends and a hard lesson on the consideration for others. It would be unfair of course, to leave Satsuki and Sui in the dust: both these characters are portrayed in a negative light towards the starting of the series. But with the show’s steady plot progression, both characters were given satisfying growth spurts and enough explorations to become decent characters, who complements Ohana’s strong presence in the show really nicely. Side characters, largely those who reside in Kissuiso, are all given pleasant amounts of screen time, personality quirks and a general likeability in all of them; ranging from a tsundere Minko (who, to this reviewer’s opinion, comes closest to being unlikeable on some occasions) to an age-conscious head waitress Tomoe, who exists as an alternative mother figure to the girls who work under her and also acts as the resident badass at survival gaming. 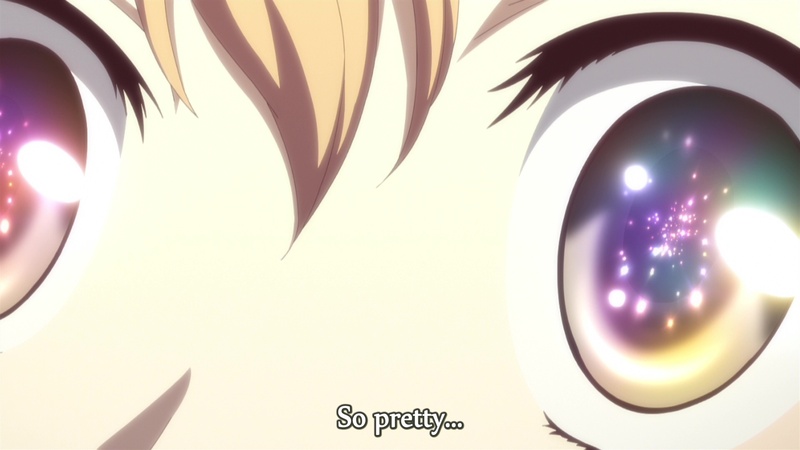 In the visual department, Hanasaku Iroha is nothing short of stunning, although it shouldn’t be taken as a surprise, considering the involvement of production studio, P.A.Works, whose works spans from action thriller CANAAN, KEY urban fantasies Angel Beats and Charlotte to the underwater visual extravaganza that is Nagi no Asakura. They have proven themselves to be a studio capable of consistent and high production values. The show’s attention to background art detail is evident in the presence of Kissuiso’s interior and exterior; a lived in but welcoming inn with its easily distinguishable personalities and stylings when compared to other featured inns in the series. The landscape background art, from the rural greenery around the inn to the urban high rise buildings of Tokyo are also given nice contrast in colours and vibrant lighting; not to mention the effortless beauty that the show maintains during night scenes, both rural and urban. Worthy of being my wallpaper. In the sound department, with no English dub to judge, and an inability to go into detail regarding my thoughts on the Japanese actors’ performance (the best I could say, is that they were solid and fit their respective characters well), I will move straight on to the music. Hanasaku Iroha seems to have an habit of not only presenting us with an abundance of OP’s and ED’s sequences, but also shower us with extra song numbers as well to accompany them. Thankfully, there do exist 2 frequently used OP and ED sequences and songs, respectively, that allows the series to maintain a solid identity within them. The first OP features a solidly performed song by nano.RIPE; sang with appropriate energy and enthusiasm, accompanied by a high quality OP sequence which featured the busy lives of the workers at Kissuiso. The second OP sequence maintains the quality, accompanied by another song performed by nano.RIPE; subjectively inferior to the first in this reviewer’s opinion. Both ED’s are solid in their simplicity: rotating frames of either light beams or maple leaves with our main characters filling in the gap, accompanied by more mellow song numbers. 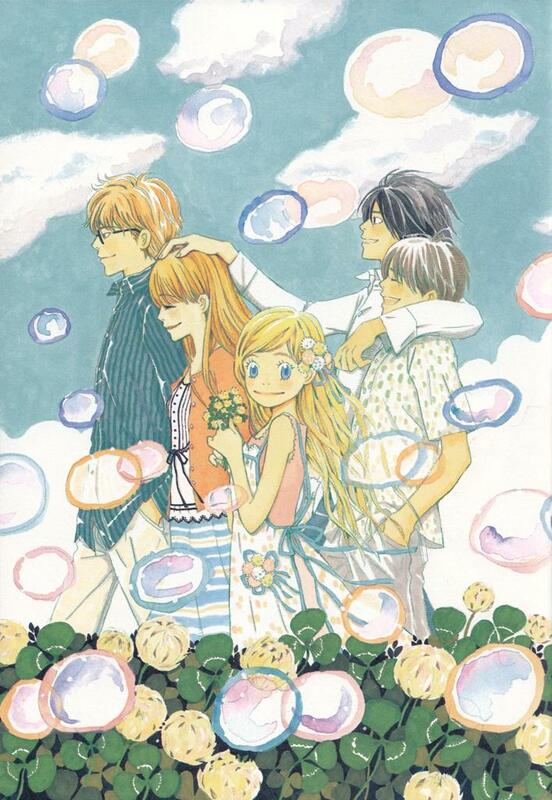 The background music and instrumental soundtrack was composed by veteran Shiro Hamaguchi, who managed to invent a score that had hidden complexities that were (and still are) rare in Slice of Life TV. With a simple ensemble of a small strings section and solo violin and cello, woodwind section, flute and clarinet solos, acoustic guitar and piano, the soundscape sounds wonderfully organic, relaxing and emotionally enriching. The tones produced by the score range from happy-go lucky to melancholy. Due to the intimate nature of the tracks, the series is prone to be wrongly accused of being ‘too light’ on music. But to trained ears, the restraint is appropriate to the show and the musical development of prevalent themes through multiple instrumentations and flavours presents a smartly utilised score. However, at its best, the score does manage to evoke a majestic sense of religiosity, heavily featured towards the end of the series, with a track that was led by a sizeable vocal choir, which also appropriately accompanies the Bonbori Festival. Check out the track ‘Ray of Light‘. Don’t forget to turn up the volume, make yourself comfortable and close your eyes. The soundscape of the musical score sounds wonderfully organic, relaxing and emotionally enriching. Can MY train dock in your uhhhhh…actually I’m not going to go there…NEVER MIND. 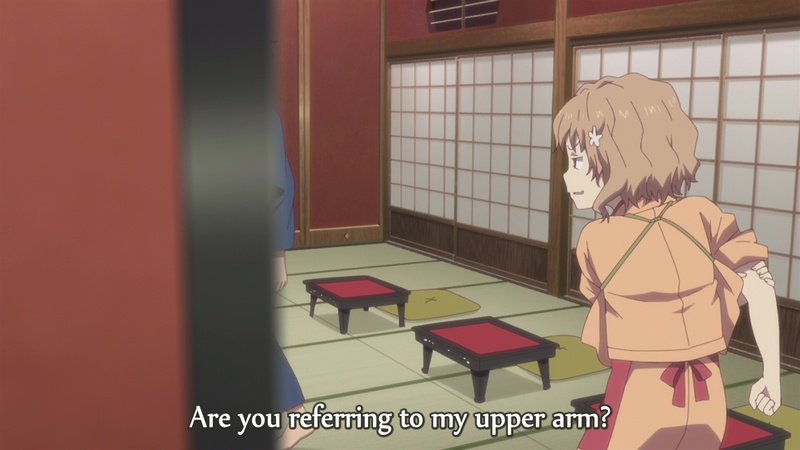 To ‘professionally’ conclude, there are some great lessons to be learnt and a wonderful slew of events to be witnessed in Hanasaku Iroha, where the daily trials and tribulations of an inn managed to slip in stories regarding rebelling teenagers, life-long dreams, the dread and reflections of old age and unrequited love. The Slice of Life genre will find a worthy advocate in this series as one that’s engaging, meaningful and above all else, entertaining. Explores motifs of self-discovery and individuality in a Design/Art university setting. Opts for more comedic elements, but also much more philosophical and dialogue-heavy. Unique crayon and watercolour-based art style. TV series is less obvious in its themes-prevalent nature; pleasantly Slice of Life. 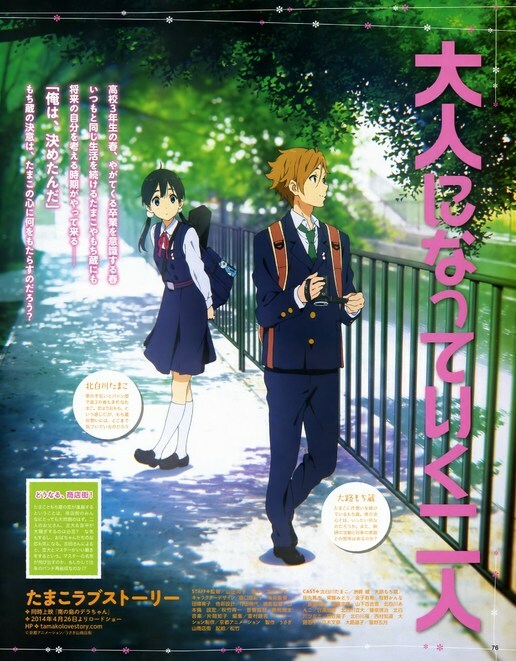 Tamako Love Story film explores unrequited love with a sense of mature intimacy, and without overbearing melodrama. Unprecedented in terms of cinematic polish and visual clarity. Disclaimer: Info below are accurate as of publication date (Dec 2015). Also, I only list sites I’ve dealt with, so naturally there will be other venders. Hanasaku Iroha is licensed for Western distribution by NIS America. Home video release includes 2 Blu-ray/DVD combo Premium Sets, each included in chipboard cases with art books. Owned by me: Yes (both sets). I can advocate for the products’ quality: the contents are secured in solid cases that are around A4 size, the surface art is vibrant and eye-pleasing, the art books are hardcover and contains ample art samples, interviews of staff, etc. In stock at: Amazon US, Rightstuf (Int. Shipping available) | NISA (Int. Shipping for fewer select countries). Well-made, painted and solid weight. Surprisingly well-balanced, considering the abnormal stance and pose. 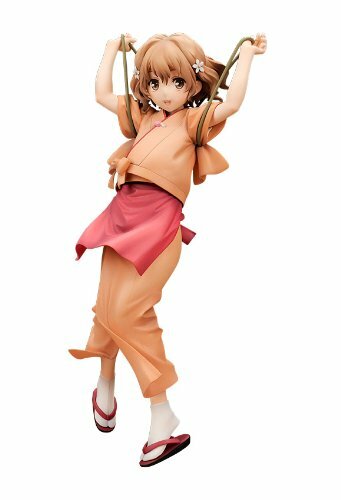 In stock at: Amazon US, Nippon Yason (Int. Shipping available).